As it launched Self Care Week today, the Forum highlights the huge number of consultations with GPs and visits to A&E by patients with common ailments – health issues that could be dealt with by their local pharmacist. Andrew Mawhinney, LloydsPharmacy Pharmacist, said: “People often visit their doctor about common ailments because they’re unsure how to treat symptoms, how long these will last and because they want reassurance that it’s not serious. The call for the public to make more use of their pharmacist mirrors one of the key messages in this year’s NHS Stay Well This Winter campaign launched a week ago. As she spoke out in support of Self Care Week, Professor Jane Cummings, the Chief Nursing Officer for England, said: “I regularly see the challenges and pressures that staff face across the NHS. Nurses, GPs, Consultants and many other NHS professionals work hard throughout the year and I know it’s particularly hard over winter. That’s why it’s important to raise awareness about the importance of self care and provide information and advice so people can manage their own health needs where possible. Professor Ian Banks, a Self Care Forum Trustee and former A&E doctor, added: “Most people are entirely capable of looking after themselves most of the time, self-treating when it’s safe and knowing where and when to seek help when they need it. There will always be others however, who might need a bit more support to become empowered and confident in making the right health decision. 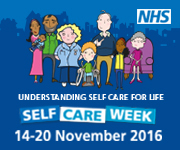 This year’s theme for Self Care Week, which runs until November 20, is “Understanding Self Care for Life” and aims to increase people’s levels of health literacy. Empowering people’s ability to self care has many benefits for their short term and long term health and this is important since people are living longer. Dr Pete Smith, a GP and Self Care Forum Co-chair, drove the Forum’s messages home, saying: “We are at the tipping point of a cultural change towards self care as a way of life and work, but for change to happen we must work together. “Our NHS is under pressure, which means it is important to choose the right service for your health needs. There is often something you can do for yourself or your loved ones first, especially when it comes to minor ailments such as cold, flu, sore throats and diarrhoea, or injuries such as sprains or strains. “Most people are very capable of looking after themselves most of the time, self-treating when it’s safe and knowing where and when to seek help when they need it. However, there are still 3.7 million visits to A&E every year for self-treatable conditions which puts the NHS under avoidable strain. “Before you visit A&E, remember what it’s there for. It provides vital care for you if you have life threatening emergencies, such as loss of consciousness, suspected heart attacks, breathing difficulties, or severe bleeding that cannot be stopped and for significant injuries. By using the alternatives you can save yourself a journey and free up time for busy staff to spend with the more severely unwell. See here for more details about the NHS England’s Stay Well This Winter Campaign and how people can self care while also helping to alleviate pressures on frontline NHS services. How are people whose first language is not English (and therefore may need a spoken language or BSL interpreter) supported to access their pharmacist. Are there systems in place and are these publicised? Perhaps the NHS should look into how Third World countries like the Philippines do it. There maybe appointments made to private practitioners but not on government-funded clinics or hospitals. Once you walk in your details are taken, as well as, asked what your problems are and be given a number ( which is not electronic but a card with just a number on it). And although the queue might seem endless, you will be seen that same day. Just booking an appointment at our local GP here takes even a week. First World vs Third World country? You must be joking!